Have you ever been searching for a gift for friends or family and felt really bored by the selection of gifts and cards on offer? Have you ever picked up a birthday card for someone and remembered you’ve bought it for them before? Or wrapped a gift not really feeling like the person receiving it will know it’s from you until they look at the gift tag? If this is you, then it’s time for you to get your creative hat on and make your gifts more personal. You don’t have to go crazy and make a gift from scratch (unless you want to! ), you just need to spend a little more time thinking about the items you’re giving. Often we can simply use wrapping ribbon on gifts, which is the same as any old present really and won’t make your gift stand out. Why not pop to your local charity shop, haberdashery market stall or go online and find an amazing craft store and buy some funky ribbon to jazz up your gift? It could be a big, bold ribbon or a really detailed beautiful one. They aren’t expensive and could be the perfect way to make your gift truly stand out. When you buy it think ‘would I want to keep that?’ if the answer is yes, you’ve found the right ribbon. With wrapping paper in the store, you tend to have two options – thin, low quality and easily ripped, or thick and expensive. Why not avoid both of those pitfalls and wrap your gifts using something other than store bought wrapping paper? Old newspaper can look really cool, as long as it’s vintage and not last weeks page 3! Or how about a pretty scarf – you don’t have to buy a new one, just buy one from a charity shop for around 99p or even better from a carboot for less (just make sure it’s clean). Alternatively you could even make your own wrapping paper. If your gift is small enough to fit into a large piece of A3 paper, why not draw doodles or even felt tip lots of lovely messages onto the paper and wrap your gift in that? The generic gift bow is not jazzy or fun at all, so now is the time for you to get creative and think about what else you could stick onto your gift instead of that samey gift bow. How about an origami flower? Or a knitted flower? You could even stick on a felt animal or string bow. The options are endless, be creative and try sticking different items on as the centrepiece for the gift wrap and you’ll see how fun your gift can look. Sometimes we don’t even put tags on our gifts, but when we do they are usually the boring paper ones that match the paper. Why not make your own tags out of your craft box using card and accessories? Or you could get really creative and make salt dough tags with holes in and thread them through string? If you’re going to put the person’s name on the gift, why not do it in style? There are endless beautiful card kits available for you to make your own card. Store bought cards are convenient yes, but that’s part of the problem, they’re never quite personal or thoughtful enough. So if you’re going to make any changes to your gift, spend half an hour of an evening with a cup of tea and your card kit and make your own greetings card, it’s the part of the gift people read and display so should be your priority in your voyage personalisation. Now, we did say you wouldn’t have to make your own gift but, it is worth mentioning the fact it’s easy for you to do so if you have the time! 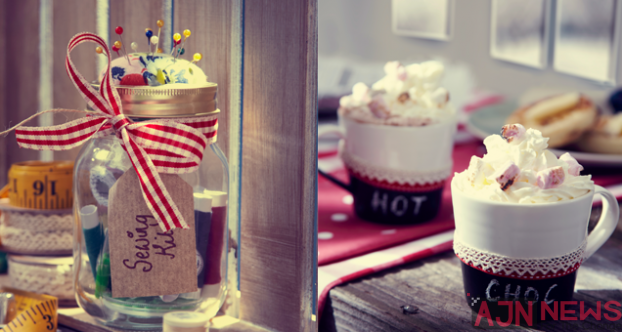 Sometimes a little handmade gift to accompany your main gift can be really sweet and personal. Perhaps a little painted pebble, box of handmade truffles or button/ bead heart ornament made from coat hanger wire and beads would be a really nice gesture alongside your main present, or just as the main present if you’re just looking to offer a little something to wish someone well on their special occasion.